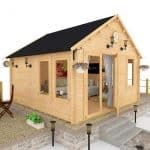 Large log cabins such as this are very practical, in that they can create extra living space for your home that can be used as an area to relax in, an office to work in, or even a guest room to house visitors. They are also a very attractive garden feature, and that’s certainly the case here thanks to an eye catching design. What particularly struck us was the four large windows, as they let light flood into the interior. It was good to see that they all opened too, so it’s easy to ventilate the cabin. We found a lot to like about this building, not least of which was the very thick and sturdy logs used. With the combination of the aesthetically pleasing shale roof it means that water is kept out, so you won’t have to worry about your contents staying dry and warm. Once assembled, it’s also a very sturdy building and very resistant to wind. The contents will not only be dry, they’ll also be safe, thanks to the inclusion of a key operated cylinder lock. With tough double glazing used on the windows as well, it’s a secure environment against the threat of opportune thieves. This is an eight sided log cabin with an apex style roof that channels rainwater away, and its unique design is very eye catching. 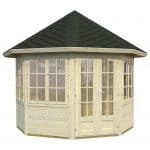 With a combination of a plethora of glazing alongside Nordic pine, it’s one of the most attractive garden buildings we’ve seen, and once painted in colours of your choice it can become a real talking point for your garden. It’s not only beautiful, it’s very practical as well. The base area, with an overall width and depth of 2.89m, fits very much in the mid range of the log cabins we review, but it’s also very tall. The apex roof has a striking bitumen shale finish on top of tongue and groove cladding, and it creates a ridge height of 3.10m and an eaves height of 2.15m. With a peak height of more than 10 feet, this feels a very roomy and spacious area to spend time in. Whilst log cabins are renowned for the strength and durability of their cladding, we were especially impressed with the interlocking cladding on display here. Whilst we often see logs of around 28mm used, this cabin uses logs that are 44mm thick. Once assembled it’s noticeable just how strong and stable the structure as a whole feels. 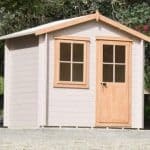 The floor, like the roof, is made of tongue and groove cladding, which we are always happy to see, and even here the thickness of 19mm is in excess of that which we often find on log cabins and large sheds. We were also pleased to see that it had integrated foundation joists, as these lift the cabin above ground level where high moisture contents that can lead to rot are often found. 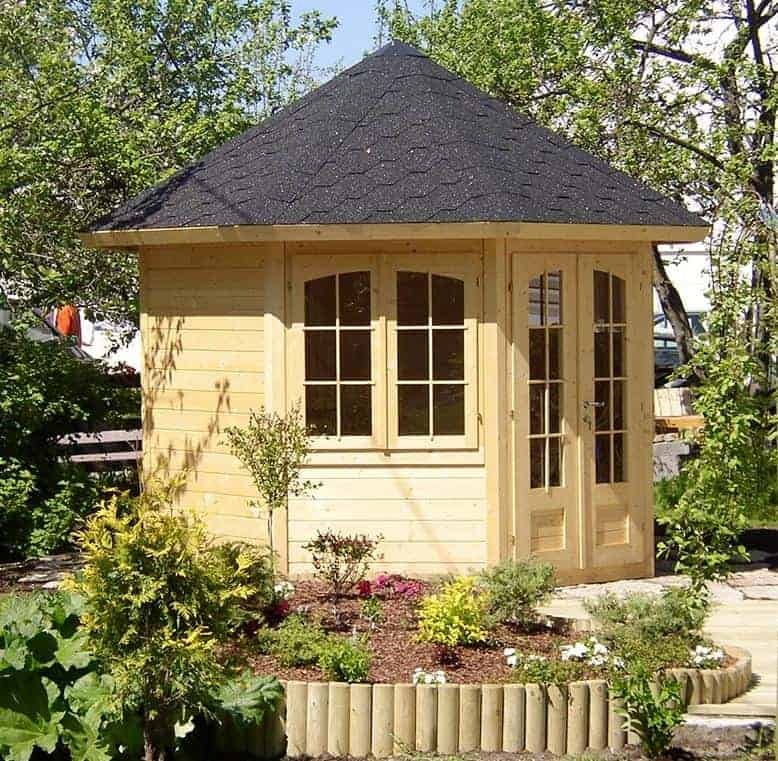 With such high quality cladding used, the log cabin has the potential to be very durable, but this will be reliant upon the owner treating the timbers with wood preserver not only on a yearly basis but also immediately after installation. The reason for this is that Palmako have not used any initial preservative treatment. At this price we would have expected them to have pressure treated the timbers, which would then typically give a 10 or 15 year warranty against rot. As it is, there is no extended warranty offered against the appearance of rot, although there is a 5 year structural guarantee provided. Whilst we found the double doors narrower than we usually see on log cabins, with a width of 0.97m they are also reasonably tall at 1.74m. This means that you may need to manoeuvre large items such as a sofa carefully to fit them inside, but this should still be possible. One thing we liked about the doors is that they are fully glazed, and in this way they are a perfect complement to the log cabin as a whole. It has four large windows which means that wherever the cabin is positioned, or wherever the sun happens to be at a particular time of day, there is always lots of light inside. With the option to ventilate or cool the interior by opening some or all of the windows too, we feel that this is a very pleasant and comfortable building to spend time in. Windows can potentially be a weak spot for would be intruders to target, so with so many windows on display here we were pleased to see that they all featured double glazing. It not only helps to keep external noise out, it’s also very tough and shatter resistant. We were even more pleased to see that a key operated lock had been included. It’s something that we always welcome, but even at this price it’s not always something we see. 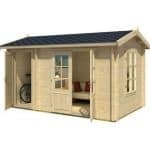 There is only one optional extra available to purchase directly with the log cabin, and while it is expensive we can imagine that it will prove popular with many. 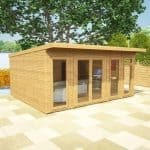 For the cost of £654, a professional installation team can assemble the log cabin on a day of the customer’s choosing. It means that people who are less than confident about the self assembly of such a large building can relax and let others complete the task for them. From first sight we could tell that this was a high quality log cabin, and as we looked in further detail this was only confirmed. It’s a pity that a building which is potentially so durable is let down by the lack of a pre-treatment. This places a burden upon the owner to keep up with the treatment schedule. The extra height provided by the roof makes this cabin feel more spacious once inside than it looks from the outside. It was good to see that the modular design of this cabin means that two people can install it in around six hours. Due to the thickness of the logs, however, and the profusion of glass, some people may opt to use the optional installation service. 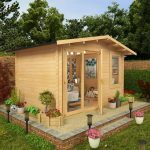 This log cabin represents a significant purchase, and while there’s a lot that we like about it, there are cheaper alternatives with a much longer warranty period. Final Thoughts: This log cabin looks stunning from the outside, but it’s once you’re inside that it really comes into its own. That’s because it feels very light and airy, which is why we feel that it would make an excellent home office or even a craft workshop. Whatever it’s used for, it’s likely to contain objects of value such as furniture or electrical items, so we were glad to see that a strong and secure locking system had been added. It’s still worth investing in an alarm, however, and another purchase that will need to be made is a supply of high quality wood preserver. It’s essential that an initial treatment is carried out, and that annual retreatments are kept up, to retain this building’s good looks.